Today is mostly dedicated to our car: Since the tire cannot be fixed it needs to be replaced and the Toyota Dealership has not been able to find the same tires anymore as the ones that are on the car now. He said he will try again in the morning. We take matters in our own hands and start calling around as well in the morning to see if indeed no such tire is available anymore in the whole area. After some calls and hearing multiple times that this tire model has been discontinued, we start believing it and give in. There is no way around getting a different tire and hope that by the time the other 4 tires are due for a change we will still get that specific tire so that we have all the same again. We give the service guy from Toyota the OK to order the tire. Good tires are quite expensive here too. Since we have to check out at the hotel by 11am and the tire will only arrive at the dealership at 1pm we take our laptops and make ourselves comfortable in the customer lounge at Toyota. We enjoy fast and reliable internet access, free coffee and free water. It’s like working in an office! As promised the tire arrives at 1pm, by then the air-filters have been changed and we also got new wiper blades and the car got a desperately needed wash. By 1:45pm we are back on the road again. Our destination for the day is Prescott. It’s only about 90 miles to get there so we take a detour to Lake Pleasant. What a disappointment we only see the dam from below but the entrance to the harbor is gated and can probably only be accessed for a fee. We don’t even ask, but just turn around and continue West on Interstate 74. We are passing some small towns (old mining towns) and slowly gain on elevation. The further North we get the steeper the hills become. We get to a high plateau with lots of horse and cattle farms. It’s still dry and the sprinklers are running everywhere but it still is a lot greener than down in the Phoenix area. Then there is another hill to climb before we get to Prescott which is up at 5,400 feet (1,600 Meter). Pine trees and forests are dominating the landscape up here. Prescott is very scattered and wide spread. We look at some hotels and motels while driving all the way to Prescott Valley. We eventually find the Days Inn with a very nice big room at a reasonable price. Glad that we found a nice room we drive 5 miles back to the “Olive Garden” for a nice Italian dinner. By the time we return to the hotel it’s already past 8pm. 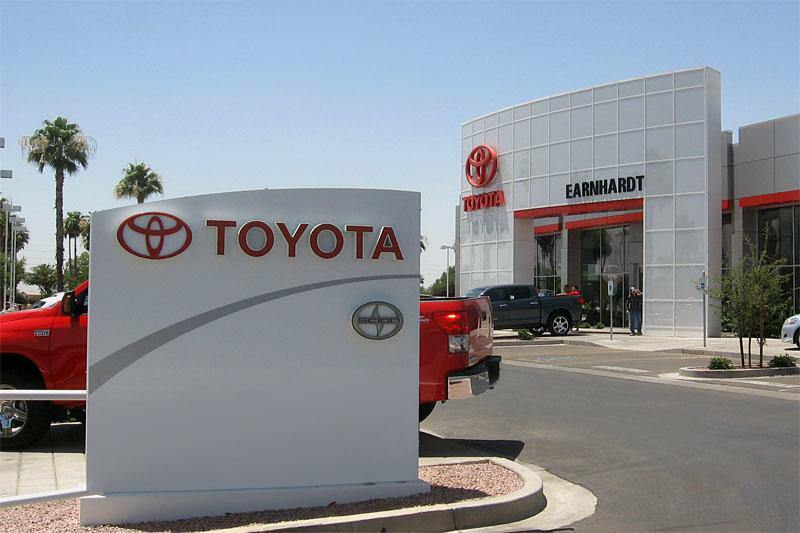 Thank you for blogging about your visit to Earnhardt Toyota. We appreciate your business. Enjoy the rest of your travels.